Does anyone happen to have a DXF file of the mb logo? I'm taking out the god awful plastic housing around the helm on my 2013 B52 and boxing it in and adding seadek through out the hole boat. I want to inlay a stainless MB logo into the seadek under the helm. PM Slaviose, I sent him a few files of the MB logo awhile back, I have switched computers and no longer have them. I’m 99% sure I have one on my computer at work. I’ll check tomorrow. Pm or post your email and I’ll send it. I cut two of them out of stainless to see if there was any interest here on the forum but never got any feedback. I donated one to the meetup last year and I probably still have the other around the shop somewhere. I started drawing up the B52 and Tomcat as well but never finished them. I’d love that file please. is there a good .DXF converter out there? 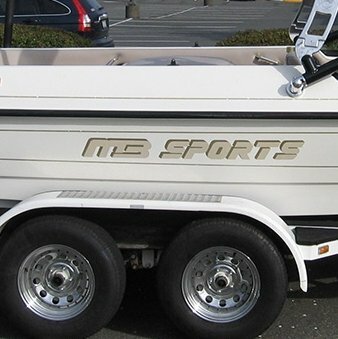 Can anyone please flip me the mb logo, looking to get my side hull done on my '95 210. The older font, whatever you have please. Pdf, dxf, dwg, etc. Got the file fyi, thanks all who responded. I would love it if someone could flip the logo file to me as well. I flipped you the dxf I received and my edits, including pdf files.